The photos are "Cross Stereo Pairs", and thus when looked at correctly, form a 3D image. In order to view these images, sit well back from your screen, look at the join between the two photos and then attempt to go "cross eyed", focusing your eyes just beyond the end of your nose as it were. It takes some practice, but eventually the two images will merge in the middle and produce the 3D image in the centre (you will still see images to the left and right of the 3D image). Once you have got it, yours eyes will "lock-on" and you can look around inside the image. Enjoy, but don't strain your eyes! Unfortunately, the technique used for producing the images cannot be used for moving trains! Once your eyes have "locked-on", you can hide the side images by holding your hands up a few inches in front of your face with a gap of a couple of inches between them. Sadly now dumped and out of use, NCB Austerity 0-6-0ST (IC) stands alongside the BR coast line from Sunderland to Hartlepool and Middlesbrough at Black Hall Colliery. It is identified by the legend "National Coal Board Durham Division No. 4 Area" on the side of the bunker and "Delta No. 2502/11" on the cabside. 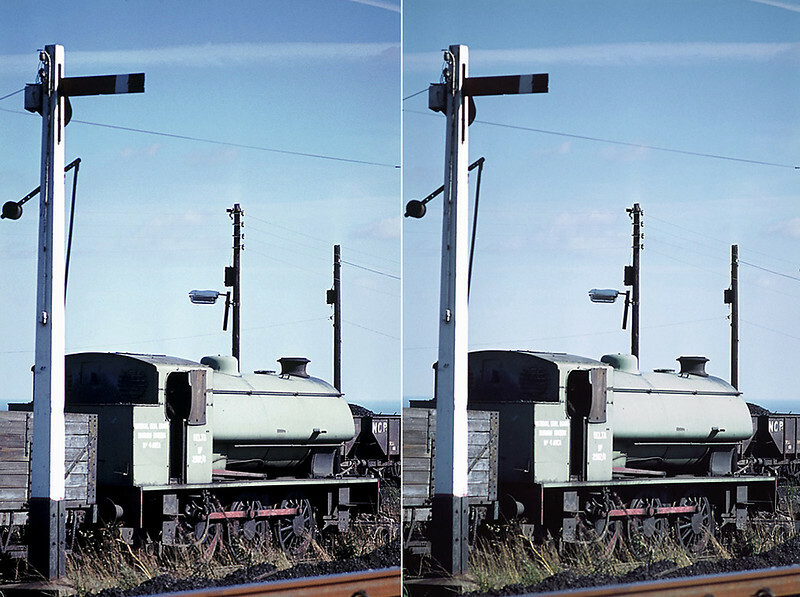 A rather splendid slotted post semaphore signal completes the scene! Thursday 30th September 1971.